Now Men Can Be Fashion Nova Fit Too! You could buy designer.. but that Fashion Nova fit! Well, ladies looks like we won't be the only gender rocking Fashion Nova's latest trends this season. Fashion Nova, shared the news of a Fashion Nova Men collection coming soon on Twitter and it will be just in time for Father's Day. Unsure of the perfect gift for your man? Sis, buy him a Fashion Nova fit you cannot go wrong. The brand is known for being sported by popular stars like Kylie Jenner, Cardi B, and many more. 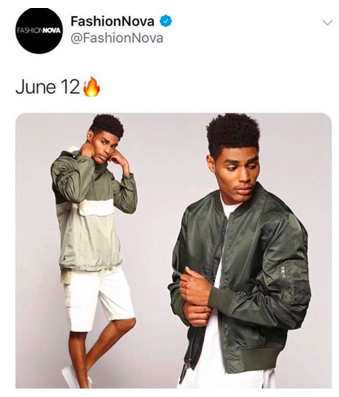 The tweet read, “June 12", followed by the fire emoji with an image of a male model sporting a multicolored windbreaker and an army green bomber. Fashion Nova is on a roll, ever since the brand first surfaced the net, it has done nothing less than shine in the online fashion world. No details have been released on the variety of pieces that are to come for the new collection, but we know based on the image above the styles will be fire! Subscribe to their mail list today so you can be one of the first rocking Fashion Nova Men this season.